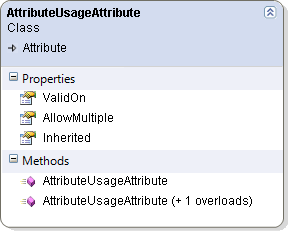 Short description: Specifies the usage of another attribute class. This class cannot be inherited. This diagram is autogenerated and may contain errors. Please report them if you find them. No code examples were found for this attribute. If you want to add a code example, you need to log in first. Don't have account? You can sign up for one right now. If you want to add a link, you need to log in first. Don't have account? You can sign up for one right now.